Rand McNally can’t be happy with everyone dropping their bulky atlases for GPS units and nav-enabled phones, so they’re fighting back. But they seem a little confused. The company is releasing a series of atlases for the Kindle, which will be purchased, delivered and consumed like any other ebook on the platform. The first maps, for Northern California, Southern California, and Washington, will be available for $1.99 each, and like the Rand atlases of your childhood, will probably be exhaustive. Rand McNally Road Atlases have been designed to work specifically on the Kindle reader. The digital atlas includes a full, searchable index of every city on the map as well as National Parks and other federal areas. The atlas also features individual overview maps of major National Parks as well as major cities and towns. Users can download content directly through their Kindle device or from their computers via Amazon.com. Kindle books include free wireless delivery within a minute of placing an order. 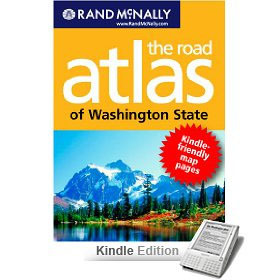 Additional Rand McNally state atlases for the Kindle are planned for 2009. From America’s number-one-selling Road Atlas, The Thomas Guide®, FabMAP® and Goode’s World Atlas to StreetFinder® Wireless and IntelliRoute® trucking software, Rand McNally has been an industry leader in the mapping, routing, geographic reference and trip-planning tool marketplace for more than 150 years. With More Roads-Better Directions™, the company’s products are sold in more than 50,000 retail outlets, directly to business, and are distributed to 98% of schools across the U.S. Rand McNally is the premier resource for online travel planning as well as maps and directions. For more information, please visit www.RandMcNally.com, call 800-333-0136 or buy maps and travel gear online at http://store.randmcnally.com/. This entry was posted on Thursday, December 18th, 2008 at 10:42 am	and is filed under General, Geography, Mapping, Merchandi$e, Promote, Software. You can follow any responses to this entry through the RSS 2.0 feed. Both comments and pings are currently closed. Over 200,000 ebooks and softwares ready foe immediate downloads….